Jack Jnr Macale Loodgebuddunge was born in 1978 in Subiaco Perth because, as he says, at that time all twins had to be born in the city. 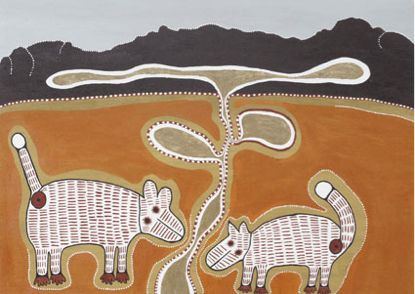 He grew up in the Fitzroy area with his mother’s people, and is the Grandson of Daisy Andrews, a wonderful artist recognised in Australia and overseas, who won the National Aboriginal and Torres Strait Islander Art Awards in 1994. Macale’s paternal grandmother Tiny Macale is also a widely celebrated artist from the Northern Territory. Jack’s father is from the Wanyjirra people of the country around Halls Creek. Macale’s knowledge of the recent histories and Dreamings of his people extends from his mother’s Bunuba country through to his father’s Gija country. 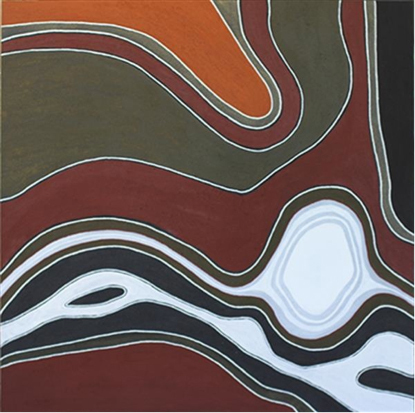 Macale is a rapidly emerging and dedicated artist who began painting in early 2006 after looking at his grandmother’s paintings and those of a local primary school art teacher when he was working as an Aboriginal Indigenous Education Officer at Lockridge in Perth. He is largely a self-taught artist, but has drawn extensively on his life experiences. In 2011, Macale was selected to participate in Revealed, an exhibition and workshop program in Perth, that featured promising young Indigenous artists from across Western Australia. In his brief career to date, Macale has won a number of art awards including The Kimberley Art Award (2008), York Society Art and Crafts Awards (2006), Gidgeganup Agricultural Society – Landscape (2006), Gidgeganup Agricultural Society – Traditional Indigenous Art (2006), and the Town of Vincent and Julie Bishop Art Award (2006). The Bunuba resistance fighter Jandamarra is an important figure in Macale’s work, which he learnt about through camp fire stories from his elders when he was growing up. As a child in 1987, Macale was involved in one of the earliest documentaries about Jandamarra, and then again in 2010, he acted as Mingo Mick in the award winning documentary Jandamarra’s War.